Israeli security forces capture wanted terrorists, shut down printers used to spread terrorist propaganda in Judea and Samaria. Israeli security forces nabbed eight wanted terror suspects in Judea and Samaria in a series of raids early Monday morning. The arrests were conducted jointly by the IDF, Shin Bet internal security agency, Border Police, and Israel Police. The suspects captured overnight included individuals wanted for various terrorist activities, including violent attacks on Israeli civilians and security personnel. The eight suspects captured Monday morning were transferred for interrogation. In addition, Israeli security forces operating in Judea and Samaria overnight raided facilities used for the production and distribution of anti-Israeli propaganda, used to incite locals to commit acts of terror. Among the facilities closed was a printing house in the city of Hevron, south of Jerusalem, which had been used to produce flyers, posters, and other materials used to promote terrorism. In a separate operation in the city of Shechem (Nablus), Israeli security personnel confiscated equipment used to produce terrorist propaganda on behalf of the Hamas terror group. 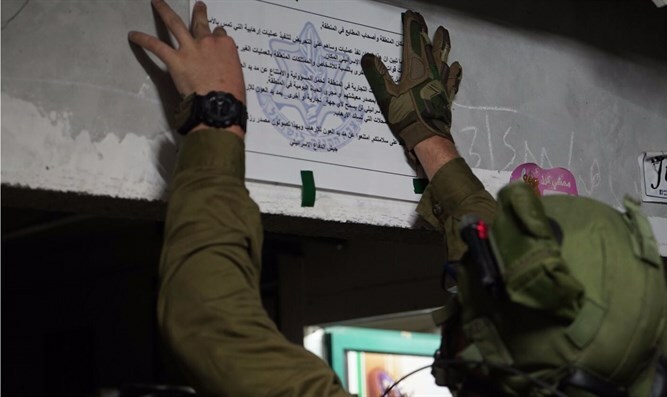 An IDF spokesperson said the Hamas operation in Shechem was just the latest example of the Gaza-based organization’s attempt to gain influence in Samaria. “The discovery of the [Hamas] operations shows us once again the Hamas terror group’s unending attempts to promote terrorism in Judea and Samaria,” the spokesperson said.